What is a paper drill? What is a paper drill used for? What kinds of paper drills are there? Are paper drills affordable / how much do they cost? All of these questions and more are answered in our comprehensive paper drilling FAQs. Don't see the question you need answered? Give us a call at (866)537-2244 (866)537-2244 or email info@buy101.com and we would be happy to help! Q: What is a Paper Drill? A: Just as the name implies, a paper drilling machine is a tool that is used to drill holes through thick stacks of paper and some other materials. They use a press-type action that slowly spins a hollow drill bit as it presses it into a stack. The rotating friction along with the sharp, hollow drill bit work together to produce a sharp and perfectly round hole. The pages are clamped into a tight stack, and then the entire stack is drilled through in one motion. 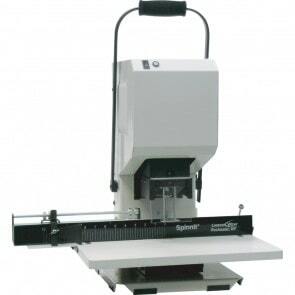 They are sometimes called high capacity hole punchers, but more commonly, just "paper drills". Q: What are Paper Drills used for? 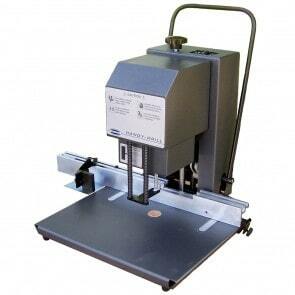 A: Paper drills are used for any number of applications, all of which involve punching holes in materials. Just a few of the common uses include punching paper for ring binders, for filing folders, for swatches, for document binding, for cancelling of casino cards, and for sign hanging. They can drill through loose leaf sheets or pages, as well as already bound documents. Q: What Kinds of Paper Drills are there? 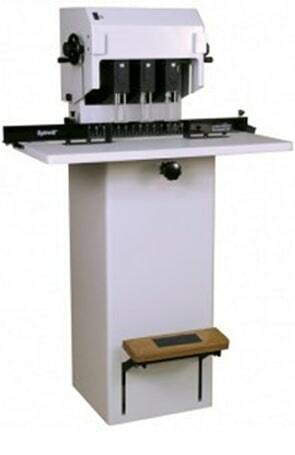 A: Paper drills are available in either desktop or floor standing models. 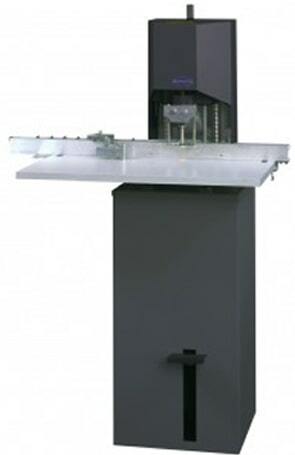 Desktop models are activated with a handle, whereas floor models with a foot pedal, which can be ideal if you're handling a lot of materials as it leaves both of your operator's hands free to work with the material. 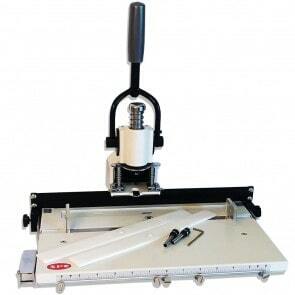 Paper drills also come in either single, double, or triple-spindle options. The spindles are the parts that actually drill the holes, so a single spindle punches 1 hole, a double punches 2, and a triple punches 3. Multi-spindle paper drills often have a mobile table and adjustable hole spacing so you can easily set them to your desired spacing, as well as smoothly move between holes. They can help increase production speed as many as 3x or more. In addition to the paper drills themselves, there are also different size drill bits available to punch different diameter holes. From tiny 3/16" holes to nearly 1/2" holes, the variety available allows for a large number of applications. Q: How much does a Paper Drill Cost? A: Paper drills can vary quite a bit in price depending on their capabilities, including what they are meant to cut through and the stack capacity. The size of the machine, the operation (i.e. manual, electric, hydraulic), the number of spindles, and the brand name will also play into the price. 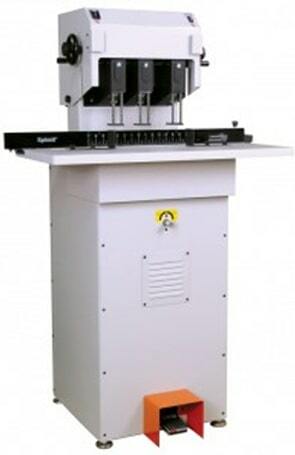 In general, desktop manual paper drills cost between $350 - $1,300, while desktop electric models cost between $1,400 - $2,500. Floor standing manual and electric models range between $2,400 - $5,000, while hydraulic between $6,000 - $10,000. We realize that this price variance can be quite intimidating for those new to paper drilling, but don't fret; call our experts at (866)537-2244 (866)537-2244 to discuss your specific drilling needs and we will help guide you to the best option for you. Q: What is the Thickest Stack I can Drill? A: The stack thickness or paper drill capacity will vary not only on the machine capability itself, but also on the drill bit length. Most drill bits are either 2" or 2 ½" long, allowing for a maximum 2 ½" thick stack. But sometimes longer drill bits are available, such as 3" thick and beyond. Q: Who uses Paper Drills? 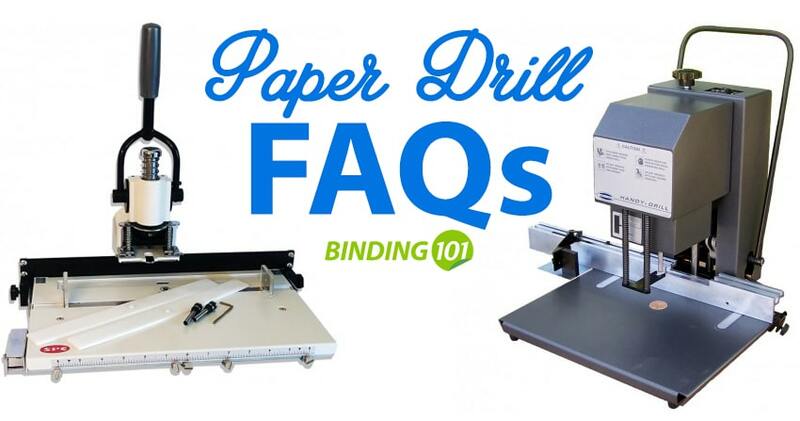 A: Paper drills are most commonly found in print shops, trade binderies, and paper manufacturing plants. But more models now available in manual desktop versions are expanding the users to offices and small businesses. Q: What do I need to Consider Before I Buy? • Drilling Thickness - How thick are the stacks you want to drill through? Know the thickest stack you want to accomplish before buying a drill. • Drill Bit Availability - Are there drill bits available in the capacity I need? What about the hole size? • Spindles - How many holes will you be drilling through your stacks, on average? Will you want to drill them all at once to save time, or will a sliding table with drill stops work? • Size - Does your space only allow for a smaller desktop model, or will a floor-standing option better suite you? Do you have any other size/placement limitations? • Operation - Would you like a manual, electric, or hydraulic powered paper drill? Even though manual drills may sounds difficult to use through thick stacks of paper, they are usually not, as they have stroking and spring-action that helps alleviate any strain of punching. Still need help? No problem! Call us at (866)537-2244 (866)537-2244 for guidance. Q: What else is Needed to Paper Drill? A: Drill bits are a required accessory for paper drilling. You will need to choose the drill bit that is compatible with your specific drilling machine, which will be dependent on the stack capacity, hole size, and locking mechanism in your paper drill. Drill blocks or drill pads are placed on the base of your machine where the stack lies and the drill bit comes into contact. They are made of either wood or plastic, and will vary in size and shape (round or rectangular) depending on the model of your machine. Drill blocks are an inexpensive wearable part, and it is a good idea to always keep extra on-hand. They play a simple, but important part in ensuring that every sheet in your stack is punched cleanly. A drill bit chip cleaner can help you press the paper waste our of your hollow drill bits safely. Trying to do so by hand or with a tool not made specifically for this purpose can be dangerous, as the drill bits are very sharp. Drill wax can help keep your drill bit lubricated, and ensure a smooth motion through your thick stacks of paper. A drill sharpener can help extend the life of your drill bits, so you don't have to buy new ones as frequently. There are several different kinds of drill bit sharpeners, including a handheld option and a manual desktop option that works a bit like a pencil sharpener. Q: What are the Most Popular Paper Drills? Here are the most popular paper drills that we offer, which include a small tabletop option that is a revolution in price, all the way up to a large hydraulic option. * Pricing listed is based on date of article posting and is subject to change. Check the individual products for current pricing.